This bawdy, hilarious, subversive and wickedly satirical drama pokes fun at the humourless, the jealous, and the adulterous alike. It features a country wife, Margery, whose husband believes she is too naive to cuckold him; and an anti-hero, Horner, who pretends to be impotent in order to have unrestrained access to the women keen on `the sport'. A number of licentious and hypocritical women request Horner's services - the country wife among them. 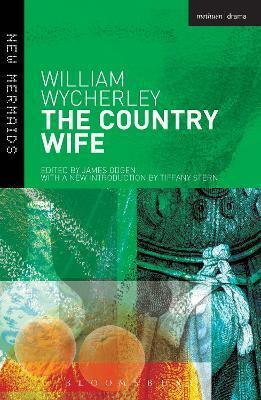 The Country Wife has provoked powerfully mixed reactions over the years. The seventeenth century libertine king Charles II saw it twice, and is said to have joined the `dance of the cuckolds' at the end of one performance; the eighteenth century actor-playwright David Garrick declared it `the most licentious play in the English language'; the Victorian Macaulay compared it to a skunk, because it was `too filthy to handle and too noisome even to approach'. Twentieth century productions heralded it a Restoration masterpiece. Sexually frank, and as ready to criticise marriage as infidelity, the virtuosity, linguistic energy, brilliant wit, naughtiness and complexity of this ribald play have made it a staple of the modern stage. This student edition contains a lengthy, entirely new introduction, by leading scholar, Tiffany Stern, with a background on the author, structure, characters, genre, themes, original staging and performance history, as well as an updated bibliography and a fully annotated version of the playtext. The Country Wife is a satirical comedy, which exposes the immorality of Restoration society in a way that has been both condemned and admired since it was written. Tiffany Stern is Professor of Early Modern Drama at University College, University of Oxford, UK. She is one of the General Editors of the New Mermaid series, and she has also edited two plays in the series - Sheridan's The Rivals (2004) and Farquhar's The Recruiting Officer (2010). James Ogden is Editor of She Stoops to Conquer for the New Mermaids series and a former Senior Lecturer in English at Aberystwyth University, UK.